I promised to get back on my new watch 🙂 At first, I was looking at Rolex watches again, but couldn’t make up my mind. Although I like the new GMT-Master IIc and the Milgauss, it wouldn’t add much variation to my current collection. Then I was looking at the Royal Oak Jumbo, but I am not ready yet to spend over 8K Euro on one wrist watch. However, as I have written before, I am a huge fan of the 1970s design of Gerald Genta. He designed the Nautilus, Overseas, Royak Oak and… the Ingenieur. The original ref.1832 Ingenieur SL is highly sought-after I believe, and the prices paid for those are unbelievable. So I decided to settle for a brand new one! To be honest, IWC isn’t my brand. Omega and Rolex are my brand, I like what they are doing and like most of their watches. However, there are some other brands that make one or two types of watches that I really like, and that’s it. I don’t care much for IWC in general. Not my cup of tea. 🙂 I do like the Ingenieur and the Portugieser line of watches though. Anyway, I’ve read some articles on the new ref.3227-01 Ingenieur, tried one on for a day (thanks G) and decided to order one. 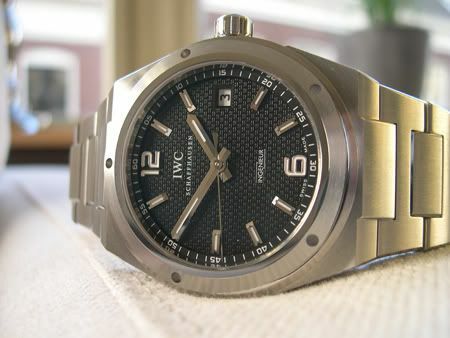 Last saturday, I bought my IWC Ingenieur at Ace & Dik in Amsterdam, official IWC dealer. It was a pleasure to meet Alon Ben-Joseph, owner of the store, in person and we had a nice chat about watches, watch blogging etc. He ordered a fresh model, so I could remove the plastic stickers myself 😉 What a treat! The watch is quite heavy (heavier than my Yacht-Master or Panerai), 216 grams to be exact. The diameter of the case is 42.5mm and 14.5mm in height. The bracelet is wonderfully crafted and it is child’s play to add or remove links. The watch/movement is protected by a soft iron inner case up to 80,000 A/m (magnetic fields), so now I can cook in our induction kitchen again :). 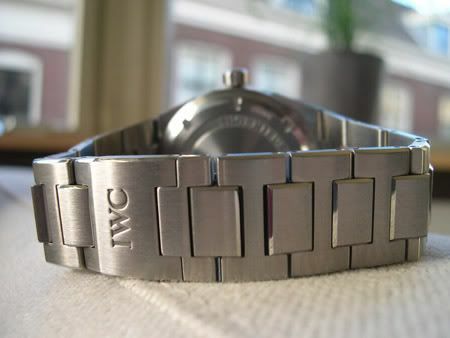 The movement itself is a self-winding IWC inhouse caliber 80110. @Justin, your guess was spot-on!